A major piece of Pima County's economic future hangs on local governments cooperating to win federal support for the proposed I-11 highway between Casa Grande and Green Valley, said County Administrator Chuck Huckelberry, who is pushing to make it happen. Officially, the proposed highway running through Tucson on its way to Nogales doesn't exist. The most recent federal legislation designates US-93 between Phoenix and Las Vegas as Interstate 11, but does not address the last leg of the Canamex trade corridor designed to link Mexico to Canada. Huckelberry said building the proposed 56-mile trade corridor is one of the county's top legislative priorities. "We want to have the balance of the I-11 corridor in the next authorization," Huckelberry said Tuesday. The push for the route - along with a second proposal to build a route connecting Interstate 19, the Tucson International Airport and Interstate 10 - is deeply rooted in economic reasons, Huckelberry said. An expansion of the existing transportation infrastructure linking rail lines and air freight while expanding high-speed options for semitrailers will lead to economic growth, he said. "It is really facilitating an international trade corridor," he said. 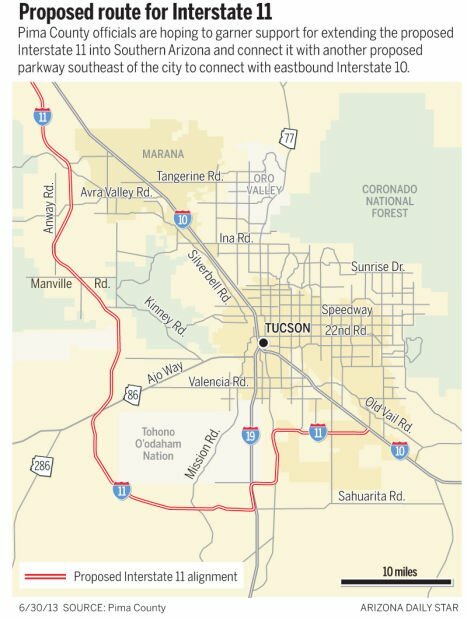 Key to that strategy is the creation of what Pima County officials are calling Interstate 510, a plan to build a new highway skirting Tucson's south side. The county also will need buy-in from county voters to approve bonds for a portion of that proposed auxiliary interstate linking Interstate 19 at Pima Mine Road north of Sahuarita to Interstate 10 at Rita Road. Several proposed routes exist, although all seek to use a portion of Hughes Access Road to connect with the airport as well as rail lines. Hughes Access Road initially was built in the 1950s with federal funding as a defense access highway, he said. A push to lobby Congress is not the only obstacle in what Huckelberry sees as a new trade corridor allowing Arizona to compete with Texas and California for international trade. The Pima County Bond Committee, as well as the Board of Supervisors, would have to back a $90 million proposal to use county bonds to help pay for Interstate 510. The latter would require winning over three of the Pima County Supervisors who opposed a similar bypass to the proposed Interstate 11 still sitting on the board. The routes at the time ran through environmentally sensitive lands in the Avra, San Pedro or Aravaipa valleys, but county officials believe the new route can minimize any damage to the environment. The Bureau of Reclamation and Tohono O'odham Nation will also need to sign off on the current proposal if it is to move forward without major amendments to the plan. Contact reporter Joe Ferguson at jferguson@azstarnet.com or 573-4346.